PicoHorus “N+2” was launched at 11AM CDT on Saturday the 2nd of Jan 2016. The payload consisted of a light telemetry beacon, weighing in at 45 grams including batteries. A small latex balloon was used, deliberately under-filled in an attempt to achieve a ‘float’ condition at approximately 30km altitude. The wind, combined with the very small amount of balloon neck lift resulted in the balloon not rising at all for a few minutes! Eventually the balloon rose above the higher ground winds, and continued on upwards at the desired ascent rate of 1m/s. The telemetry beacon transmitted the ‘standard’ RTTY telemetry as well as an experimental binary FSK mode developed by David Rowe. The binary telemetry was transmitted between the RTTY telemetry frames, and proved to be far more reliable than the RTTY telemetry, especially in low SNR conditions(more to come on this!). Unfortunately the demodulator for the binary telemetry is not quite in a ‘user friendly’ state yet, and so it was only used by a small number of listeners, with the rest using the dl-fldigi software. Special thanks to Joe VK5EI and Ivan VK5HS for tracking the RTTY payload through the majority of the flight! The balloon proceeded to head east to the Victorian border while slowly ascending to a maximum altitude of 28376m. After floating for approximately 20 minutes, the balloon burst, sending the payload plummeting to the ground at 15m/s. 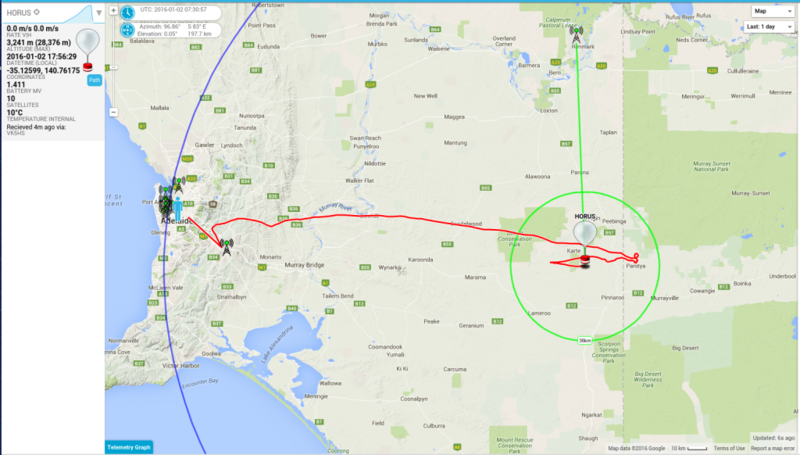 The balloon was tracked down to 3.3km altitude by Ivan, from his home QTH near Renmark. 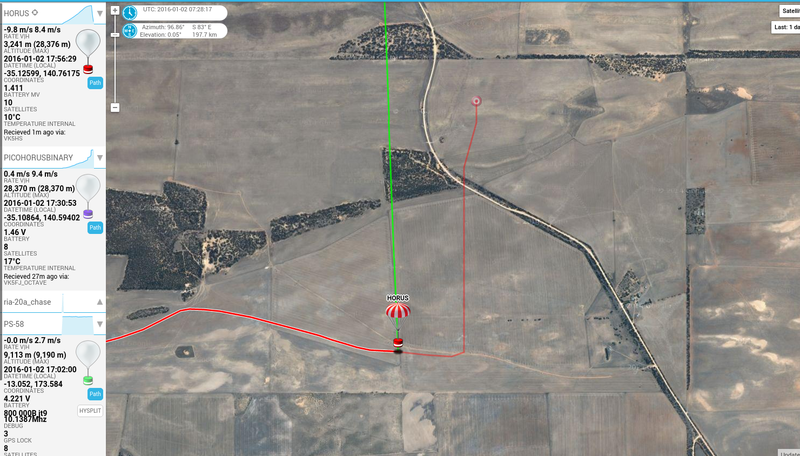 The final position placed the balloon about 25km north-west of Pinaroo, SA, approximately 200km east of the launch site. This payload wasn’t originally intended to be recovered, but given the landing location looked reasonable for a recovery, Andy VK5AKH and Mark VK5QI decided a Sunday drive was in order to see if the payload was still operational. Leaving Adelaide at around 8:30am, they arrived at the expected landing site around 11:30am to find the payload still transmitting strongly, and reporting a position just 50m away from a road. A short walk into a field had the payload in hand! Thanks again to everyone that helped out decoding telemetry, without your input we would have not been able to recover the payload. Our next balloon launch is scheduled for late January – stay tuned!